In The Making of a Teenage Service Class, Ranita Ray uncovers the pernicious consequences of focusing on risk behaviors such as drug use, gangs, violence, and teen parenthood as the key to ameliorating poverty. Ray recounts the three years she spent with sixteen poor black and brown youth, documenting their struggles to balance school and work while keeping commitments to family, friends, and lovers. Hunger, homelessness, untreated illnesses, and long hours spent traveling between work, school, and home disrupted their dreams of upward mobility. 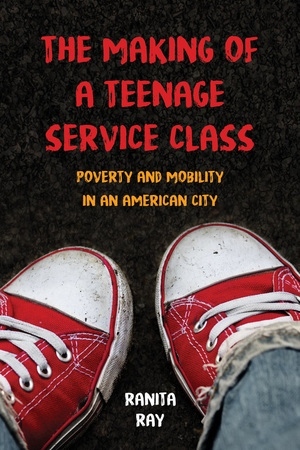 While families, schools, nonprofit organizations, academics, and policy makers stress risk behaviors in their efforts to end the cycle of poverty, Ray argues that this strategy reinforces class and racial hierarchies and diverts resources that could better support marginalized youth’s efforts to reach their educational and occupational goals.